your All-Star Honda MVP card! EVERY TIME you use your MVP Card! 5% BACK to put toward your next All-Star Honda vehicle! There is no purchase necessary to pick up your MVP Card. See an All-Star team member for details! receive a instant $150 credit on your MVP card. Take advantage of this MVP treatment today! 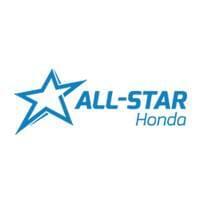 MVP cards are available for all All-Star Honda customers. Customers not purchasing a new vehicle will not qualify for a $150 pre-loaded MVP card, but will be eligible for the 5% back for all parts purchased and/or service work. 5% MVP credit is not earn from the purchase price of a new vehicle. See an All-Star team member for more information.